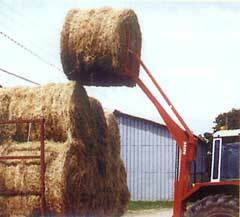 The most versatile and economical way to handle round bales. 2 pairs of claws fitted to a hinged mast. 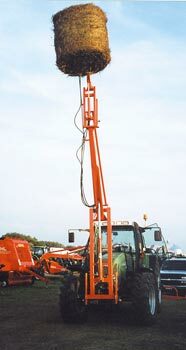 Three hydraulic cylinders - three hydraulic outlets needed. 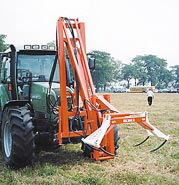 Permanent front mount that fits the front of most tractors. 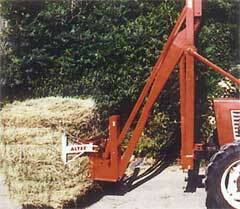 Altec has the largest range of bale handling equipment of any manufacturer worldwide. 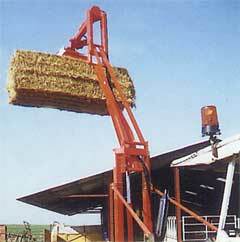 Model MA400G - lifting height 3.8 m (13'+), stacking 4 bales high. 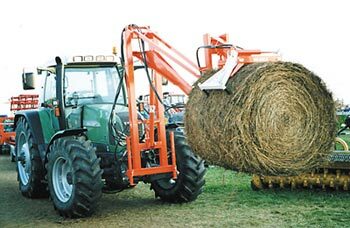 Model MA500G - lifting height 5.20 m (17'), stacking 5 bales high. 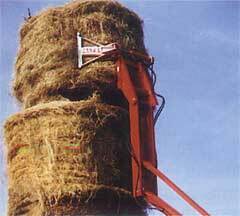 Model MA600G - lifting height 6.40 m (21'), stacking 6 bales high. 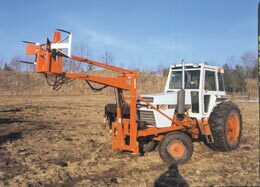 Model MA700MC - Type MC700 - with horizontal rotation feature, can handle 1 - 2 square bales simultaneously, stacking either lengthwise or sideways.